Legends of the health benefits of green tea go back thousands of years. We happily continue this tradition with our line of authentic green teas. 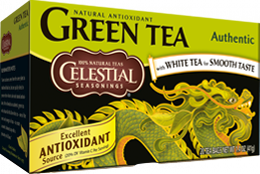 Regain your balance, awaken your spirit or overcome the odds with our green tea blends, each with naturally occurring green tea antioxidants and packaged in boxes inspired by traditional Asian artistry and wisdom. With a combination of simple ingredients, complex flavors and natural goodness, these teas are the perfect addition to a healthy diet and active lifestyle. They're an excellent antioxidant source (with 20% DV of Vitamin C per serving), and many of our green teas are infused with delicate Bai Mu Dan white tea for the smoothest taste you’ll find. 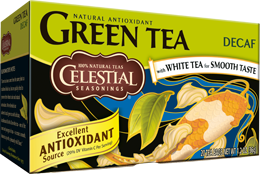 Back in the 1990s, Celestial Seasonings introduced the health benefits of green tea to millions of Americans. Today, we're pleased to offer a full line of smooth green teas that offer the perfect combination of good health and great taste. Antioxidant Vitamin C. We've added 20% of your recommended daily Vitamin C to each serving of our green tea -- an extra antioxidant source you'll appreciate! Flavonoid Antioxidants. Counter the harmful effects of free radicals in your body by adding green tea antioxidants (called flavonoids or polyphenols) to your diet. Caffeine. With less caffeine than your average cup of coffee, green tea might have just the lift you're looking for. Of course, we also offer several Naturally Decaffeinated varieties for a completely relaxing green tea experience.